A huge tip of the cap to Tony Lee and the Triway Titans....they gave us everything we wanted, and were one big play away from pulling the upset. What an effort by their players and their coaches. Titan receivers Kyle Maxwell, Sawyer Polen & Marcus Bertsch had all but a few of QB Derek Carmichael's completions, and all three made their share of incredible catches on 3rd and 4th down. There were more than a few drops and that hurt, but for the most part, their receiving corps performed admirably. The Titan line did a much better job of containing the Orrville rush, both up the middle and on the edge...and what can you say about Carmichael. Tough kid. Had over 250 total yards on the night and never quit grinding. Feel what you will about Triway (and the color purple)...but hopefully there's some respect buried beneath your dislike, or heaven forbid, hate. That's a strong word to use towards a group of young men who left their hearts on the field Friday night. Can't say enough about Mr. Turner. He's just on a different level, or at least he was Friday night. I don't think I'm overstating things when I call his three touchdown, one interception performance one of the greatest playoff performances ever in Orrville's 21 appearances. In terms of playoff games at Red Rider Stadium, I'd call it a tie with Kyle Simmons 400+ yard all-around effort against Canton Central Catholic in the first round of 2006. Not sure we win the game if he's not in it. All his big plays were momentum shifting, it's hard to say which was more important. His 93 yard TD reception from Kyle Lichti (which was thrown perfectly) jump-started a really stagnant offense early on. His 70-yard punt return for a TD gave the Riders an 8 point lead and somewhat of a cushion. Never seen a player stop and start quite like that....maybe since Rider great Dru Robinson. His last scoring strike, a 51-yard pass on another perfectly delivered ball from Kyle Lichti, came just 20 seconds after a 3 minute Titan scoring drive that pulled them to within two (20-18). If you count just runs and receptions, Turner only had three touches. That's not enough for someone as explosive as him. Needs to touch the ball 10 times a game (counting kickoff and punt returns). Another night of too many penalties. Thought we had this problem licked. Way too many 15-yard penalties. That speaks to a lack of discipline, and after week 11..that's not an oddity, that's an identity. We shouldn't be hitting late. Simple as that. Pretty sure one kid had two personal foul penalties on the night. You'd think that would earn someone some time on the bench, but I didn't see that. It's going to jump up and bite us as we travel down the playoff trail. Get it fixed. Big congrats to Tre Simpson who surpassed 1,000 rushing yards with his 28 carry, 120 yard, 1 TD performance against Triway. He stands at 1,079 on the season to go along with 18 TD's (14 rushing, 4 receiving). He put up 1,070 yards with 19 TD's last season and 89 rushing yards and 2 TD his sophomore season. All totaled, that puts him at 2,238 career rushing yards and 39 touchdowns. His career rushing yards are good enough for 4th place all-time, and just 3 yards behind Dru Robinson for 4th all-time at Orrville. That's some good company to be in. For the second week in a row, we've seen Orrville try, and succeed, at a fake punt. In the Wooster game, Drew Brenner used his speed to turn a 4th and 14 into a first down. Against Triway, Drew found Max Pirman wide open for a big gain down the middle on 4th down. The play setup a touchdown and gave Orrville the lead going into halftime. Heard Mason had a little bit of a swollen knee going into the game, and that's why his carries were limited on offense. Still got 7 carries for 24 yards. He's our short yardage back and, when 100%, can be an every down back as well. Need him and even Matt Davis to see some runs heading into the Elyria Catholic game. Coach D is now 3-0 in home playoff games, and 5-2 overall in three appearances. Not too shabby. Also, he now has 40 career coaching wins, in just 5 years. Any coach, anywhere would love to average 8 wins per year. Guess what the football team did the first thing Saturday morning. No, they didn't sleep in....they didn't study film either. They raked leaves around town as a way of giving back to the community. I liked hearing that. It's not all about football, it's about instilling character and work ethic in young men. This would have been done win or lose. Love that kids are being taught that the sun will rise in the morning, no mater what happens under the lights. It was cool to see the 12 football seniors (and two senior cheerleaders, I think) take one final walk the length of the football field. Great to go out with a win, obviously. Football is done for the season at Red Rider Stadium, that's kind of sad, but nice to know we're still playing. Orrville's playoff teams sure do know how to test the hearts of their fans. The two-point win over Triway was the 16th playoff game (out of 45 total) decided by 7 points or less. Orrville has won 9 and lost 7 in those games. Our last three playoff games have been decided by a total of four points. Not sure any playoff run will top the 1998 state title run in terms of heart-stopping moments. All four wins were decided by 9 points or less that year. So round two brings the Panthers of Elyria Catholic. More about them later in the week, but some quick info. They're another team that likes to air it out. They pass, pass and pass. Quarterback Danny Reaser is their gunslinger, similar to Ashland in the way they spread it around to several receivers. He threw for an amazing 503 yards and 6 TD's earlier this season in a win over Elyria that was televised on Fox Sports Ohio. Type in Danny Reaser on YouTube and you'll see a few impressive highlight videos on him. Zack Rogers is Reaser's favorite target with nearly 1,500 receiving yards and 14 TD's on the season. He reminds me a lot of 2010 Orrville grad Sam Miller in his explosiveness and speed. Their defense doesn't strike me as anything that we haven't seen. They've given up their fair share of points this year...but it will probably come down, as always, to how our defense does against their passing attack. Luckily we've seen a lot of good passing teams this year. Here's the Panthers schedule and results on the season. Seven of their ten games this year were against teams in Division 4, 5 or 6. They beat Huron in the mud, 28-21. Their QB said after the game that if it were on turf, they'd have won more handily. He gets his wish this week. Ken Dukes Stadium has field turf and seats around 4,000. As the lower seed, we'll be on the visitors side. Both the home and away stands have their own pressbox so I have no idea how to tell the home and away side apart. Looks like the visitor side is closest to the school on this map. Took the following picture during a flyover in the Red Rider Sports Blog spyplane. Nice looking facility. Plenty of parking, turf field, new scoreboard. Sort of reminds me of Canton Central Catholic's field. Looks like the bleachers are sort of far away from the field, like Wooster and CCC. 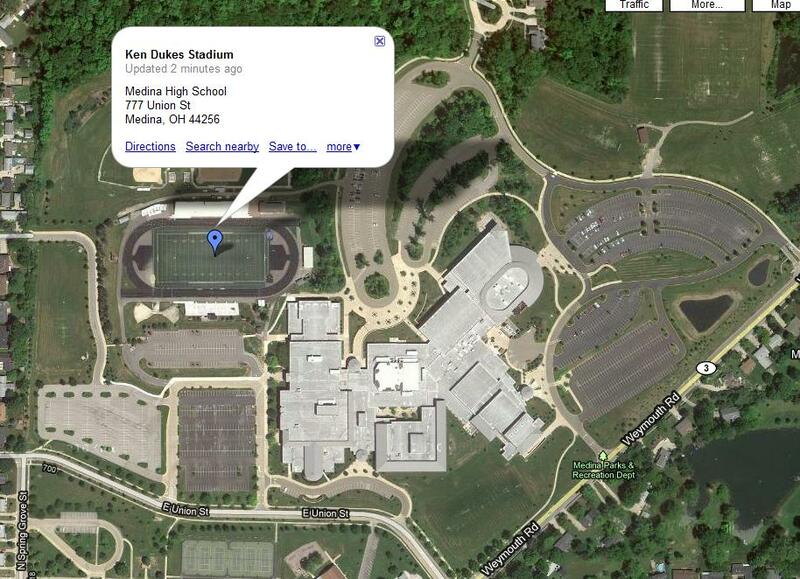 The address of the stadium is 777 Union St., Medina if you want to put that in your GPS. Click here for a interactive map & access to directions. Not sure the best way to go. Route 57 into Medina seems fine, but traffic always snarls right there in the middle of town. Might be simpler to take Route 57 and split off there at River Styx Road and take that up to Route 18 and turn left. That would bring you in from the east and might miss a lot of that downtown Medina traffic. Just a thought. This will be the second time the Red Riders and Panthers meet in the playoffs. The first time was in the state semifinals in 1984. Elyria won 14-13 and went on to win the state title the following week. Here was the article from that game. Sounds like the Riders did enough to win the game...it just didn't happen. It prevented one of the most talented teams in OHS history from getting a second straight crack at a state title. That team had at least four players that ended up with Division I scholarships, Jack Leeder (Ohio U. ), Keith Denson (Tennessee), Tom Bolyard (Ohio State) and Tom Moore (Ohio State). Maybe it's time for some payback this week? Interesting that in the 1984 game, Elyria Catholic had ZERO yards passing...this time around, they may have zero yards rushing. Football sure has changed. For some reason, Red Rider playoff teams seem to play well once that first game is out of the way. We've had some memorable week 12's in our history. In 1994, we beat undefeated and defending state champ Wauseon in overtime in week 12. In 1998, we took down Goliath in the form of Youngstown Ursuline in week 12, and just last year, we took down the mighty Comets of Genoa in week 12. All totaled, Orrville has played in week 12 eleven times...and we're 8-3 in those games. We've won the last four week 12 games we've played in. See what I mean....we like week 12 for some reason. The common theme in those three games mentioned above? We were the underdog and not given much chance to win. I've said it numerous times, doubt the Orrville Red Riders at your own peril. This team plays like no other with a chip on it's shoulder. Scoff if you will, but armed with only a cellphone, I was able to know the score of any game played in the state on both Friday and Saturday nights. No longer do you have to rely on attending a game in person, or it being on the radio, to know the score. With twitter, anyone with an account can send updates via text message right from their seats. If you want to keep up on the scores...I've got two options for you. Bookmark the "ohsaa_scores" twitter account and also the #ohiofb twitter hashtag. You wont miss a single score, and you'll have them well before the 11pm news. You don't have to join or sign up for anything. It's really great, and a perfect use of technology to keep everyone in the know. How about those county teams? Congrats to the Dalton Bulldogs, Hillsdale Falcons and the Norwayne Bobcats. All three advanced to the second round over the weekend. No win was more impressive than Dalton's win over #1 seed Bucyrus Wynford. The 'Dawgs beat a team that has a 48-game regular season win streak going. The fact that all three won speaks to the level of competition in the county league this season. Sure teams like Smithville and Waynedale struggled, but those teams are probably .500 or better in other areas of the state. Dalton will be in action this Friday over at Canton Central Catholic field to take on McDonald. Hillsdale gets Patrick Henry out in Bowling Green and Norwayne get powerhouse Youngstown Ursuline over in Green....both games are Saturday night. Nice to also see Ashland and Clear Fork pick up big wins for the Ohio Cardinal Conference. Copley lost which wasn't a surprise at all, but good to know that all three Red Rider losses came to playoff teams. Let's start in our own region 14 where the other semifinal pits Genoa against Clear Fork. Couldn't believe Genoa got held to just 7 points and it was enough to beat Ottawa-Glandorf. They'll have to be just as impressive to beat Clear Fork this week. Game will be played out in Tiffin. I say Clear Fork...but close. Youngstown Mooney takes on Akron St Vincent-St Mary in a division 3 showdown over in Uniontown on Saturday night. Only good thing about this one is that one of them will lose. I'll say Mooney wins by 14+ in this one. And the big one Saturday night..undefeated versus undefeated in division 1. Cleveland Glenville vs. Lakewood St. Edward at Parma Byers Field. Too bad one of these teams has to lose. This much talent on one field at the same time. Could be memorable. I really want Glenville to pull it out and win a state title for the Cleveland Public Schools. This may be their biggest road block. That's all for now....got a special game preview coming Wednesday with a well-known guest blogger. Enjoy.